Jill Peterson and Kevin Heinz are both 28 and from Minnesota. Jill danced growing up and in college, she told Meredith Vieira and Matt Lauer on the Today's show that she "loved dance as a way to express yourself and share joy." The wedding dance entrance was jill's idea, and everyone went along with it. 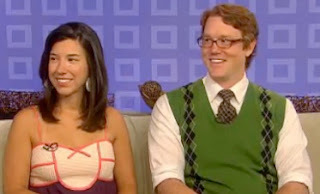 Jill and Kevin met when Kevin’s childhood friend, Jeff, married Jill’s college friend, Ann, in 2005. They were both in the wedding party. Jill could not resist Kevin’s wit and charm. Kevin could not resist Jill’s intellect, nor her remarkable dance moves. Kevin said this about posting the video on youtube, "I put it up because her dad had been really harassing me to get it out to some of his other family members, and it exploded," Heinz said. The video has over 2 million hits on youtube.